The ice formations at the Apostle Islands Ice Caves are formed by the waves washing against the base of the cliffs. With Lake Superior frozen over this is no longer taking place. However, the ice created by the seepage from above the cliffs and in the ceilings of the caves continues to create more and better ice formations as the winter goes on. More photos from the Apostle Islands Ice Caves can be found on my website. Wednesday morning it was cold again with strong winds so we decided to put on our cold weather clothes and drive over to Houghton Falls and see what it was like in the winter. Fortunately other people had been visiting the area and there was a well packed path all the way out to the lake. It was a little treacherous because the path was only about a foot wide in some spots. With all of the snow they have had in the area if you stepped off of the path you went in up to your knees. It was a beautiful trip. With all of the snow in the Bayfield area it was a winter wonderland. More Houghton Falls photos can be found on my website. I was out walking around the farm this past week photographing trees after a fresh snowfall. About an hour before sunset the sun starts to hit the Apostle Islands Ice Caves. This is when the serious photographers turn up. As we move into February and March the sun will move enough to really light up the caves. Big Weekend in Bayfield Wisconsin. This year for the first time in a long time you might be able to experience a number of outstanding events on the same day or at least the same weekend in the Bayfield area. 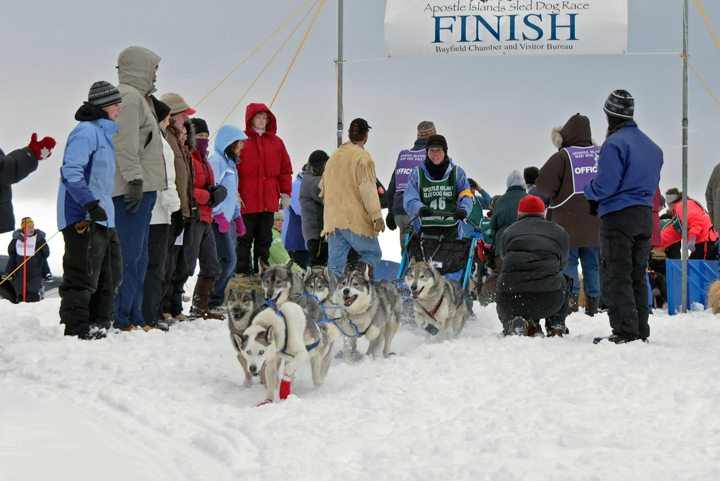 The weekend of February 1 and 2, 2014 the Apostle Islands Sled Dog Race will take place. 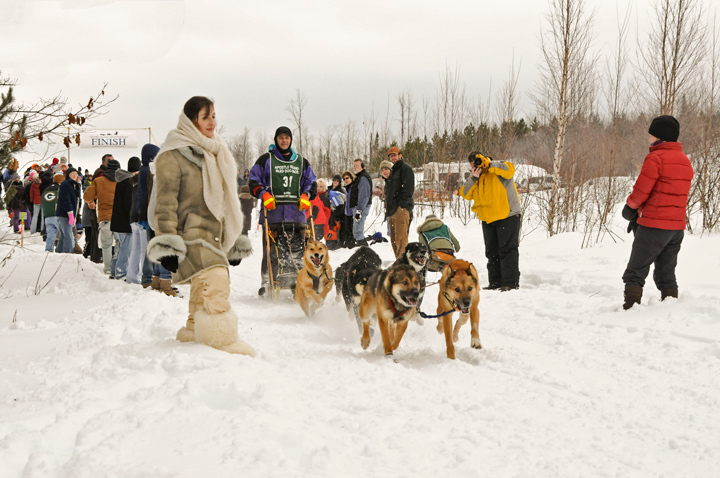 In my opinion this is one of the best sled dog races for spectators because there are a large number of sled dog teams that participate. In addition, it is possible to get up close to the dogs and it is easy to watch them come out of the starting gate. There are no bad seats at the event. Since the race is an out and back race you have time to watch them take off in the morning, enjoy lunch in Bayfield, and return to the race site and watch them come back early in the afternoon. 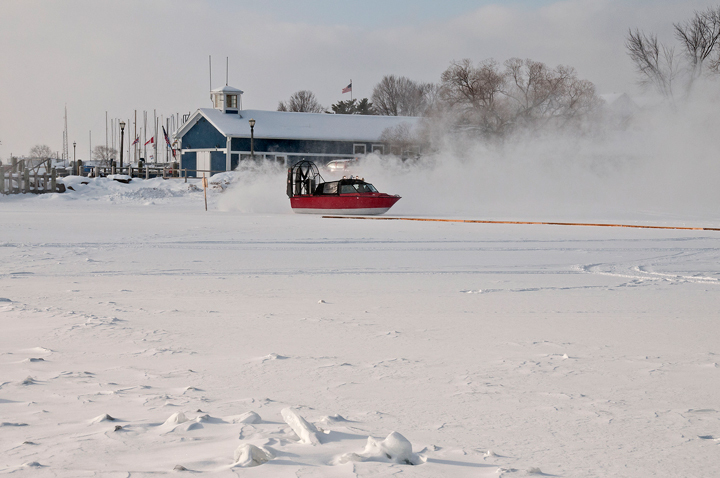 While in Bayfield you can drive out to Madeline Island on the ice road. The ice road to Madeline Island opened this past week so the ice should be good and solid by the time of the sled dog race. When we were at the race last year the wind sled was operating still operating. 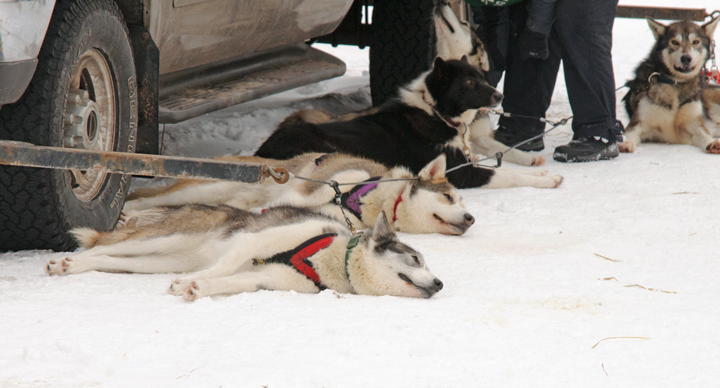 In addition, the Apostle Islands Ice Caves are open so you have a chance to watch some of the sled dog race, drive out to Madeline Island on the ice road and walk out to the Apostle Island Ice Caves all on the same day. A better option would be to stay in the area and enjoy the events over the course of the weekend. Our original plan was to visit the ice caves on MLK day and then ski the next day. The next morning it was very cold and with a wind chill of -20 so we spent some time in Washburn visiting a friend in the morning and then decided to head back to the ice caves for the afternoon. There were other people visiting the ice caves but not the numbers that we saw on MLK day. Although I had taken my tripod out with me the day before I didn’t use it because there were too many people wandering around so I just use one lens an 18-200mm lens for a NIkon DX camera and took a lot of handheld shots. With less people around I took out the tripod and also used my 11-18mm lens to get some broader shots in the caves. Again we walked several miles along the shore looking at the ice. Later in the afternoon the serious photographers started to show up. We started to see more people with tripods and serious camera equipment. Late in the afternoon the sun starts to shine into the caves and really brings out the colors in the rock. earlier in the day we noticed some fat tire bike tracks in the snow. As I was setting up a shot of this ice fall a couple of fat tire bikers came riding by. We took our time walking back to Myers Beach so we could check out the sun on the caves and take in the sunset. It was almost dark by the time we reached the car. It was another beautiful trip to the Apostle Islands Ice Caves. More photos of the Apostle Islands Ice Caves can be found on my website. My wife and I have been out looking for Bald Eagles on the Mississippi River this Winter. With the cold weather most of the river in our area is frozen over. The eagles have been forced to congregate in areas of open water. We have developed a little road trip that takes most of a day. We start out by driving from Menomonie, Wisconsin to Durand, Wisconsin. In Durand we stop at the River Valley Bakery to pick up some artisan bread and pastries. Unfortunately they are closed until the 13th of February. We can’t wait until they open again. When they do open they have limited hours so call ahead. Our next stop is Alma, Wisconsin where the eagles gather just below Lock and Dam number 4. The Mississippi River is almost completely frozen in the area so the only open water is found just below the dam. There is an outdoor viewing platform at the lock and dam and Wings over Alma also offers a free viewing deck. The times we have been there we have seen a dozen to over thirty Bald Eagles. We then head down to Reads Landing, Minnesota for lunch at the Reads Landing Brewing Company. They have limited winter hours so check their website. At Reeds landing there are usually a large number of Bald Eagles searching for food in the open water. The great thing is that you can have lunch at the brewery and watch the eagles at the same time. 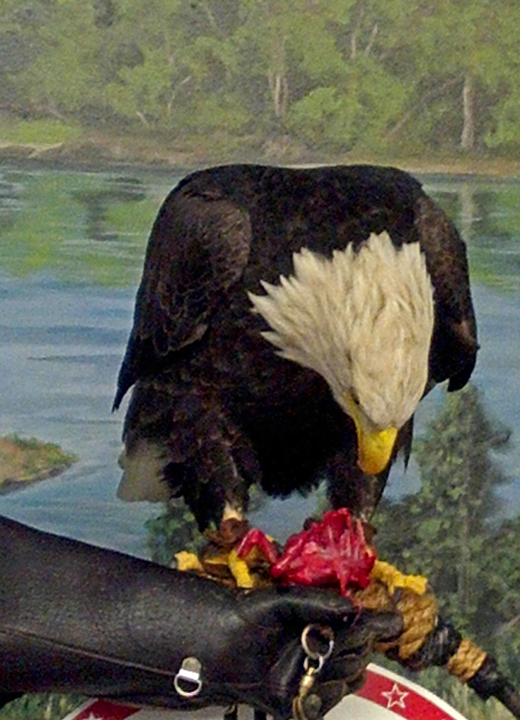 If you haven’t been to the National Eagle Center in Wabasha, Minnesota you should stop in. They have five captive eagles that are on display and they do daily presentations. Generally you can see wild eagles from the Center. They also have an eagle count on their home page so it is a good way to see where the eagles are gathering. When we stop in Wabasha we try to visit the Olde Triangle Pub for some fine Irish stew. No the eagle is not dining at the Olde Triangle Pub. We stayed in Bayfield during our recent trip to the Apostle Islands Ice Caves. Unfortunately there is not a lot to do in Bayfield this time of year because most of the business are closed during the week. We did spend some time walking around the harbor area checking out some of the fishing boats that remain in the water all winter long. All of the sailboats were in winter storage. Bayfield has a lot of snow this winter. More Photos from Bayfield can be found on my website. My winter wish was fulfilled this past week when the Apostle Islands Ice caves became accessible from Lake Superior for the first time since 2009. It has been big news around the state. My wife, I and a friend headed over to the ice caves on MLK day. It was slow going with about four inches of fresh lake effect snow causing slick roads. As we approached the Myers Beach parking lot I bet my wife that there would be a lot of cars in the parking lot. The temperature was around five above and she didn’t think anyone else would be crazy enough to come out in this weather. In fact she didn’t think we would be able to go out to the caves. It turned out I was right. The parking lot was almost full. There were all kinds of folks gearing up to go out to the caves. I talked with someone who had been at the caves the day before, the temperature was almost thirty degrees, and they said the parking lot was full and folks were parked along the access road and clear out onto highway 2. Some of the folks we met just as we started out were wearing snowshoes but they said that so many people had been on the trail since they went out that there was a well worn path to the caves. Most people walked and some of them were using ice grippers. Although not required ice grippers make it much safer to walk on the ice. There were a few skiers on the trail but I don’t recommend skis because they would just be in the way if the goal was to explore the caves. It had been an overcast day when we started but later in the day there was some muted sun shining through the clouds. We walked about three mile along the lake shore photographing the ice caves. This was the first time for my wife and our friend so it was quite a thrill for them to see the caves for the first time. More photos of the Apostle Islands Ice Caves can be found on my website. We have had a couple of snow storms move through in the past week. It has been cold so I’ve been around the farm photographing birds.